This Mediterranean style home opens with a dramatic entry featuring extensive moldings that continue throughout. Exceptional details include period windows, fireplace mantels, staircase & Spanish tile roof. Spacious rooms feature large windows providing abundant light. The beautifully appointed kitchen with quality appliances, a marble island countertop and a fireplace connect to a butler's pantry. Easily accessible patio featuring large fountain is surrounded by exquisitely landscaped grounds. Covered south facing deck is accessible from two bedrooms. Rare three car garage with automatic gate. This home has incomparable character, architectural quality and design. The location is beautifully residential yet vibrantly urban. 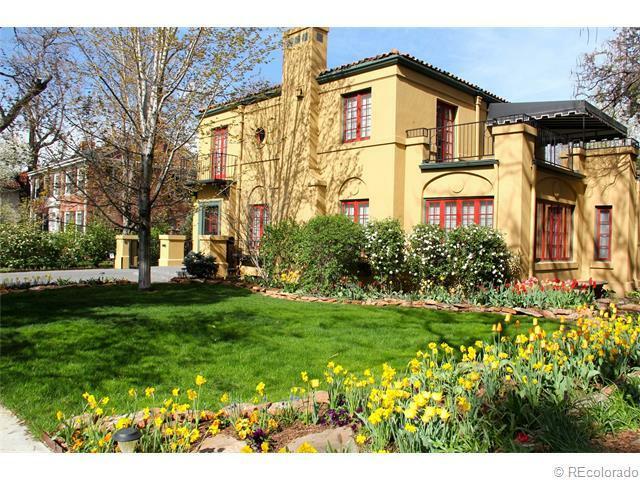 Easy, quick and direct access to Cherry Creek North or downtown dining, sports, shopping and preforming art centers. Truly a most desirable home and lifestyle are delicately blended.